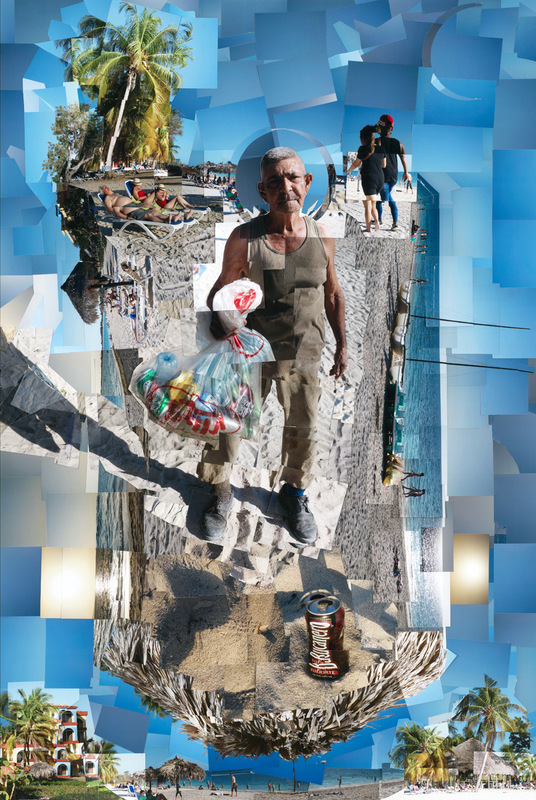 Cuba In Transition is an ongoing series of eighteen large-scale photomosaic murals, audio interviews, and field recordings created on three trips by the artist to Santiago de Cuba, Baracoa, Havana, Viñales, Cienfuegos and Trinidad de Cuba shortly before President Obama's landmark trip to the island in March 2016 and most recently in February 2017 after the death of Fidel Castro. Each mosaic is handmade using scissors and tape to assemble hundreds, sometimes thousands, of 4x6" photographs, taken from different angles. Neither a computer nor Photoshop is used. Culled from dozens of interviews conducted in Spanish, diverse voices and perspectives reveal the inner worlds of everyday Cubans. Set to a soundtrack of instrumental Cuban music, this project creates a welcoming space for conversations about some of the most salient issues of our time. 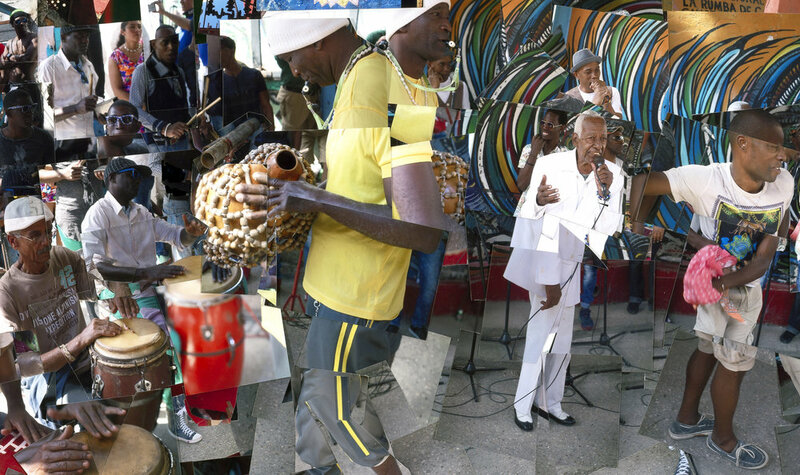 An homage to the people of Cuba, the exhibition opened at A.P.E. Gallery in Northampton, MA in June 2017 and quickly became one of the most attended shows in its forty year history with over 3,500 visitors. It has since traveled to New England's largest Latinx cultural center Villa Victoria Center for the Arts in Boston, Colorado's Loveland Museum, Williston's Grubbs Gallery, and Deerfield's von Auersperg Gallery. 2016, Cut photographs and tape, 3.5 ft. x 4.5 ft.
Trinidad de Cuba, 2017, Cut photographs and tape, 4 ft. x 5.7 ft. He wandered by me silently, an elderly man collecting cans amid the sunbathing tourists. He'd retired from a job at the hotel, cleaning the beach where we’d met. He said he needed to supplement his pension. 100 cans earns him 40 cents. His wife lives eight hours away by car. Stricken with Parkinson’s, she can’t hold the phone so it’s hard for them to talk. Gracious and warm, he called me “hijo” (son) and told me, “No government is good,” before hurrying off to catch the last bus home. Watch the making of this piece from start to finish here. 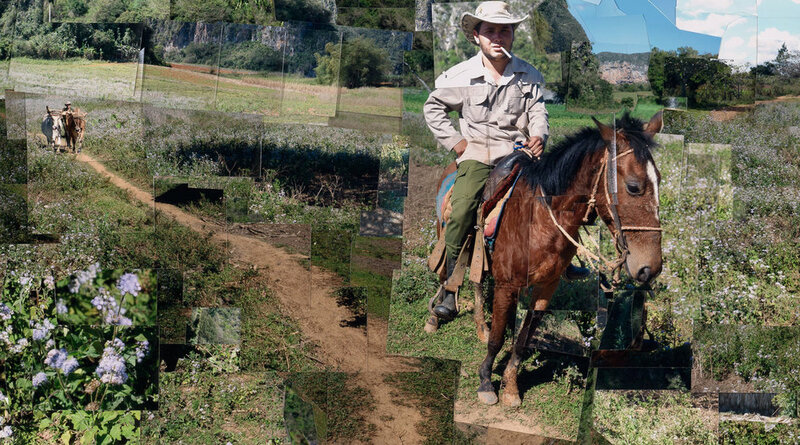 Inaccessible by car, I traveled on horseback with Manolo for ninety minutes into the Cuban outback to meet Nena. She said I was the first tourist to visit her in sixty years. She told me she worked cutting sugarcane as a teen for $10 a month before a friend lent her money to start a livestock business raising and selling turkeys and goats for meat to local Cubans, which she’s done from her farm since the late ‘50s. Here she is in front of her outdoor kitchen surrounded by the hard-earned abundance of her labor. 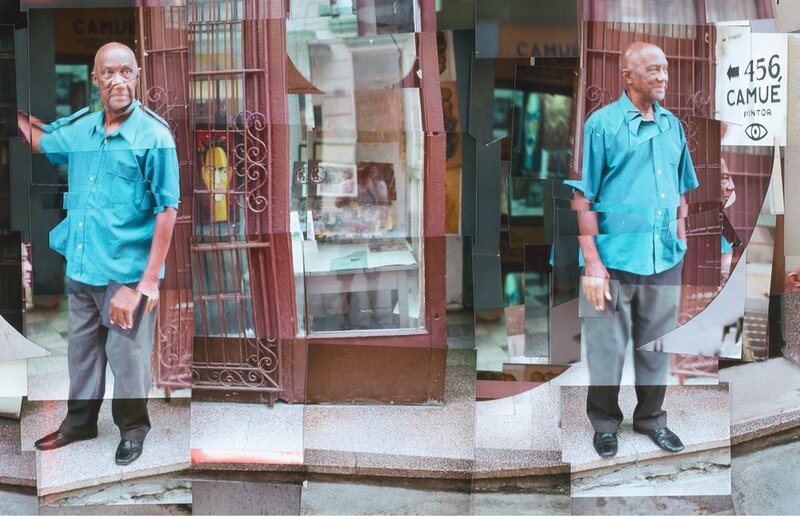 Santiago de Cuba, 2015, Cut photographs and tape, 4.5 ft. x 5 ft.
Santiago de Cuba, 2015, Cut photographs and tape, 3.2 ft. x 6.3 ft.
Santiago de Cuba, 2015, Cut photographs and tape, 4 ft. x 11.4 ft.
Havana, 2017, Cut photographs and tape, 4.8 ft. x 14.3 ft.
Havana, 2016, Cut photographs and tape, 5.7 ft. x 7.8 ft. I happened upon this scene in Habana Vieja. A solitary man, without parts, without tools, reviving his car. Progress was glacial, but evident. Everyone focuses on the shiny, old cars. But they all start here. He said the engine’s an '82 Toyota, the body a late 50s American model. Classic Cuban ingenuity, as couples stroll by. 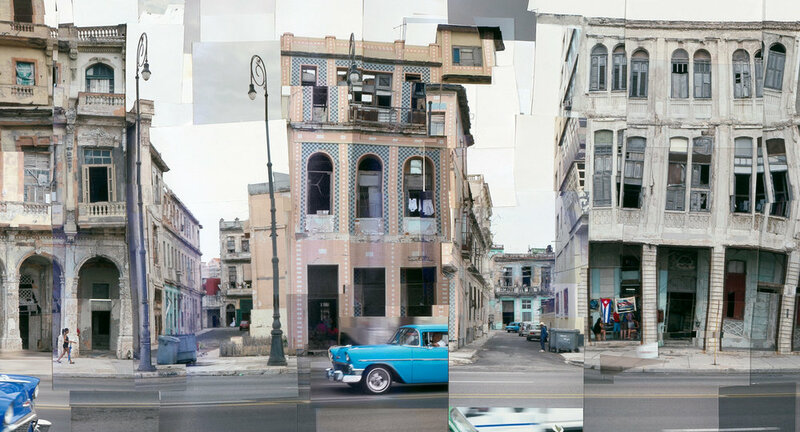 Viñales, 2016, Cut photographs and tape, 3 ft. x 10.7 ft.
Cienfuegos, 2017, Cut photographs and tape, 5.8 ft. x 11.8 ft.
Havana, 2016, Cut photographs and tape, 3 ft. x 11 ft.
Every Sunday this block rocks to the rumba rhythms. 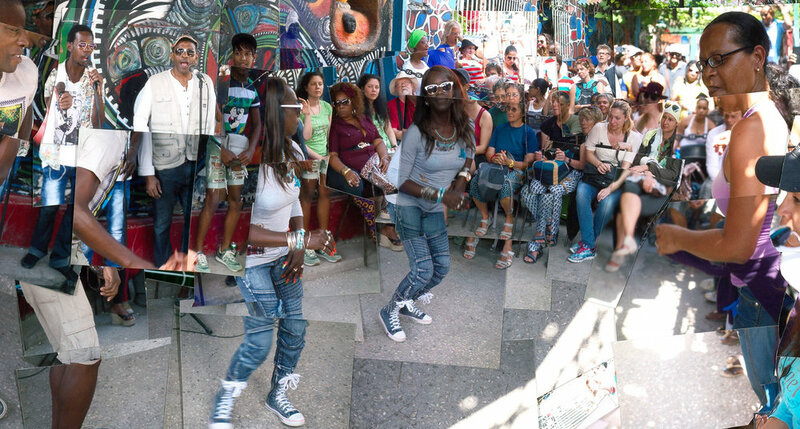 Closed off to traffic and surrounded by hundreds of feet of building-high murals by Cuban artist Salvador Gonzáles Escalon, it's the perfect place to get lost in the power and soulful beauty of Afro-Cuban music and culture. 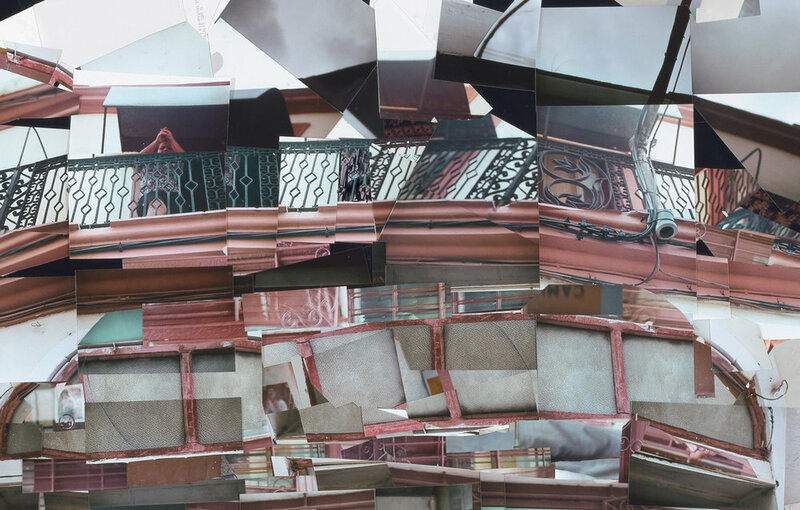 Santiago de Cuba, 2015, Cut photographs and tape, 4 ft. x 7.2 ft.
Santiago de Cuba, 2015, Cut photographs and tape, 4.2 ft. x 7.8 ft. Portraits of Afro-Cuban women in a store-front window caught my eye. As I approached, a voice beckoned me in. It was Lincoln Camué (82), the renowned painter, and this was his studio, a room at the front of his home. We talked for an hour, connecting as artists. I returned a week later to chat some more and photograph this piece, now the cover of an Oxford University Press psychology textbook. View it here. 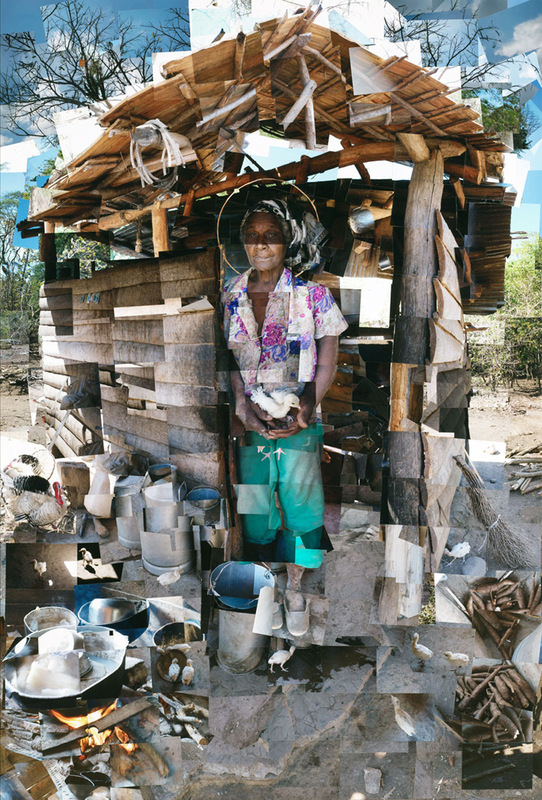 Santiago de Cuba, 2016, Cut photographs and tape, 3.3 ft. x 6 ft.
Viñales, 2016, Cut photographs and tape, 4 ft. x 5.6 ft.
Viñales, 2016, Cut photographs and tape, 3.7 ft. x 11.8 ft.
Santiago de Cuba, 2016, Cut photographs and tape, 3.8 ft. x 6.3 ft.
Viñales, 2016, Cut photographs and tape, 3.2 ft. x 15 ft.